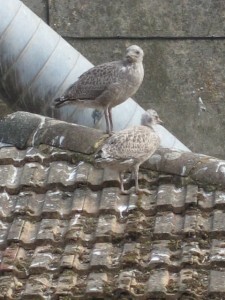 Here it's possible to see the difference in size and feather colour between an older and younger baby Herring gull. Apologies for not keeping everyone up to date with the progress of the baby Herring gulls I watch from my home office window, which requires me at times to squeeze myself into a small space and contort myself out of the window to take photos. First, the sad news. The five baby gulls I’ve been chronicling here I watch on a nearby roof are now four. The body of the fifth is still on the same roof. I can only speculate as to how and why she died. I really don’t know what happened. There were originally three baby gulls; however, suddenly, one morning, there were five. So, we speculate the two additions, who are smaller, slid over from an adjoining roof. It’s not always possible to see all the baby gulls on the roof tops. Often, you only know they are there because you can hear their high-pitched squeaking. The two additions are younger than the original three because they are noticeably smaller and their feathers haven’t started to turn grey. The older three periodically race around and flap their wings with great enthusiasm. Now, they’re able to lift off and raise above the roof by anything up to six inches or so. I’ve been trying to get a photograph of this but by the time I’m ready with the camera the little devils have stopped. I will persevere because it’s quite an enjoyable and remarkable spectacle! 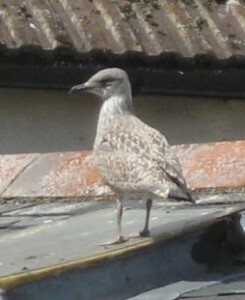 Here's the baby Herring gull who suddenly found herself on another nearby roof. After I took this photo I saw what must presumably be one of her parents with her. As they grow older and start to learn how to fly and have the capacity to do so, it increases the chances of the baby gulls leaving the roofs where they were born and raise. This morning, for example, I saw for the first time on another nearby roof a baby Herring gull where there had not been any activity. I think she must have flown over — perhaps with the help of a gust of wind off the sea — to an adjoining roof where it has been possible to watch another group of baby gulls. The holiday season in the Old Town is upon us. The activity significantly increases with the number of visitors. It three weeks time we have Carnival Week which, as things are typically done here, last 10 days. Anyway, July into August is the time of peak activity in the Old Town. Not least of which includes helping out boisterous adolescent Herring gulls learning to fly. I often wonder what the feeling must be like to discover that you have such super-natural powers as to fly and be carried along with the wind currents and with the occasional flap get them to take you where you want to go.